At-Risk Missing Person Patricia Hodge - Last seen at 10 am in the 4900 block of Mildred Dr. (Glenview/Glenmoor area). 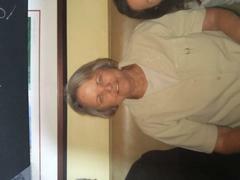 Patricia Hodge is a 75 year old female who has not been seen since approximately 10 a.m. this morning. Patricia suffers from a medical condition and we believe she is lost. She was supposed to travel from the 4900 block of Mildred Dr. on foot to the 4600 block of Central Ave but did not show up. She was wearing a tan brim hat, brown zip up sweater, brown pants and white tennis shoes. She sometimes frequents the Fremont Hub. This is the first time Patricia has gone missing. Our Department and Patricia’s family appreciate any tips and/or information of sightings today. Please call 790-6800x3 if you have any information.